The new Uni-Therm from Rigel Medical accurately measures the performance of electrosurgical generators including high frequency leakage, high current, power distribution and patient return plate alarm testing. 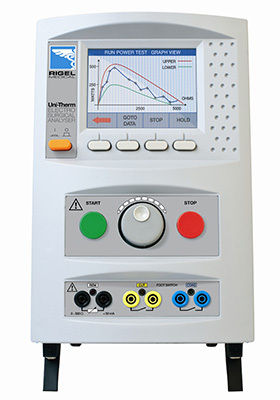 Compliant with IEC 60601-2-2*, the high performance Uni-Therm is capable of verifying and calibrating all major electrosurgical generators whilst guiding the user through all test procedures automatically and most of all safe. Product features include built-in memory, test automation, comprehensive data management facilities and a wide range of in-built resistors, while a large full colour screen displays easy-to-follow, step-by-step instructions to ensure the correct connection to the device under test. The Uni-Therm high performance electrosurgical analyser forms part of a comprehensive range of high performance specialist biomedical test equipment supplied by Rigel Medical. Visit the electrosurgical analyser product page for more information.